In addition to Exede Internet, ViaSat offers home phone service to rural areas where cell reception is lacking or traditional landline phone service is expensive or unreliable - Exede Voice. Exede Voice offers unlimited local and long distance service covering the entire United States and Canada for only $29.99/mo. Exede Voice is available only to Exede Internet subscribers who have 12 Mbps service and live in the continental U.S. Sorry, Exede Voice is not available to Exede5 or WildBlue internet customers, or to customers in Alaska or Hawaii. There is a minimum 6-month billing term, and Exede Voice will be included in your Exede Internet bill. Exede Voice setup is easy. Exede will provide an Exede Voice Adapter which you will connect to the Exede Modem and your home phone. Exede Voice is very easy to setup with your existing wireless phone base station. Exede Voice is a residential service. Calling is unlimited, but if you go over 3,000 minutes in your billing cycle, Exede will monitor your Exede Voice traffic to determine if you're engaged in non-residential use. If you use Exede Voice for commercial purposes, Exede may terminate your service. Good News! Exede Voice use is not counted as part of your Exede Internet Data Plan. Free long talks on long distance calls with your friends and family. Unlimited local and long distance service that covers the entire United States and Canada. Voicemail, call waiting, caller ID, call forwarding and 911 service are included. Exede Voice calls do not affect Exede Internet, and don't count toward your internet data usage. Get $10 off your Exede Internet bill when you bundle Exede Voice. 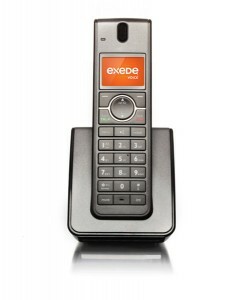 Exede Voice supports 1 phone line per account. In most cases you can keep your current phone number. Easy setup with any type of home telephone. International calling plans are available.